Reigate is a town in Surrey, situated at the bottom of the North Downs, in the London commuter belt. It boasts a medieval castle and remnants of a Bronze Age settlement. Reigate can be reached by car via the A25 and A217. 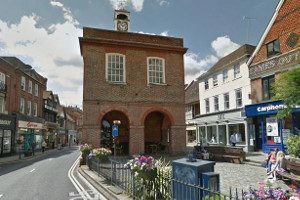 Reigate is well served by public transport and Reigate railway station has regular services to London Victoria and London Bridge. Lanes School of Driving was first founded in 1914. Since then it has taught generations of locals to drive and established an enviable reputation for excellence. Each pupil is treated as an individual at Lanes, and driving courses are carefully tailored to suit. Pupils who wish to learn fast can choose our intensive driving course. Theory can be taught along with practical lessons are as part of a separate course. On passing their test, pupils can advance their skills with a range of after pass courses. These include: Pass Plus, Motorway Driving, Parking Skills and Advanced Driving. We appreciate that pupils can be very busy have packed schedules. At Lanes, pupils have freedom to choose lesson times that are convenient to them. Lessons are available as weekly courses or as single one-off lessons. Lanes is pleased to offer all its pupils the opportunity to be taught on a one to one basis. In our experience this ensures that every pupil has the full attention of their instructor, leading to a more efficient learning process. Lanes has an excellent range of top car models for pupils to learn on. With Lanes, pupils can be collected from their doorstep and returned there when their lesson is over. Lanes have been providing driving lessons in Reigate, Surrey for many years. Please call us today on 020 8166 5678 or click here to send us an email via the contact page. Lanes has over 40 driving instructors available. Pupils can choose the one that best matches their prefered style of instruction. Our instructors have successfully taught pupils from age 17 to over 70. Nervous pupils will be reassured by our experienced instructors. Each of our instructors is a highly qualified Approved Driving Instructor, registered with the DSA. Pupils will retain the same instructor for the duration of their lessons to ensure continuity. Lanes have a team of driving instructors in Reigate, Surrey. Please call us today on 020 8166 5678 or click here to send us an email via the contact page. Pupils can be very anxious before their first lesson. Female drivers sometimes feel intimidated by the idea of having a male instructor. At Lanes, female students can opt for a female driving instructor. Female driving instructors at Lanes are very good at calming their pupils. We find that our female pupils feel more relaxed with our female driving instructors. Lanes have a selection of female driving instructors in Reigate, Surrey. Please call us today on 020 8166 5678 or click hereto send us an email via the contact page. Some pupils request that they learn on automatic cars. Manual cars can provide the experienced driver more control. However, for the beginner, automatic cars are far less daunting. Automatic cars are simpler to drive; more importantly, they cannot be stalled. Pupils who chose automatic cars can usually make faster progress. Lanes have a selection of automatic driving instructors in Reigate, Surrey. Please call us today on 020 8166 5678 or click here to send us an email via the contact page.